The realization that maybe I couldn’t cut it on the line in a high-end restaurant kitchen came when I found myself trying to melt into the wall. It was May 2012, and after two full days working at Addison—San Diego’s highest-end restaurant—I was watching Friday-night service from the pass between chef William Bradley’s sparkling kitchen and the wait staff. The quiet rhythms of prep and mise en placehad given way to the frenetic pace of service as Bradley called orders and line cooks answered. It was the first time I’d ever felt totally out of place in a kitchen. I could not have kept up. The stage (pronounced “stah-zh”) is a time-honored restaurant-industry tradition. Depending on the context, it involves aspects of internship, job interview, exploitation, free education and/or culinary tourism. Mine, at Addison, had been more of the latter: a little bit of prep work and a lot of watching the cooking of dishes and service. 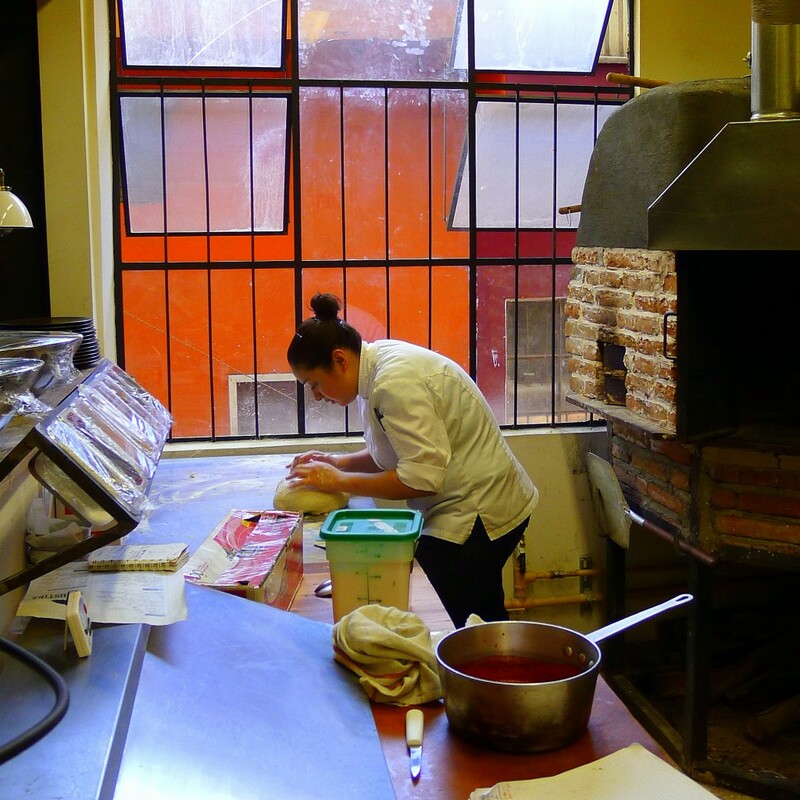 Two years later, on the other side of an international border, and awaiting the beginning of another two-day stage—this time at executive chef and co-owner Chad White’s La Justina Gastro Bar in Tijuana—what struck me were the juxtapositions between Addison’s opulence and an Avenida Revolución that was still in the process of transition from catering to American Navy sailors and college students to a more sophisticated tourist zone featuring upscale restaurants and art alleys. Opulent, La Justina’s setting was not. Edgy? Perhaps. I followed prep chef Coco Fonseca from the avenue’s morning light into a restaurant space I had seen while dining the night before. It looked entirely different empty and in the dark. We passed through the swinging door into a semi-open kitchen space infused with light from a large window looking out on an alley and the brilliant orange wall of the opposite building. Prep started much as it had at Addison, with simple repetitive tasks involving no heat or blades. Before long, I was on to finer knife work, cutting cactus paddles into brunoise and pickling them. A defining feature of work in a professional kitchen is the scale of each task. Where a home cook might prep enough for a few dishes, the same task is magnified exponentially in a restaurant setting up for the night or making several days worth of a basic preparation. And yet, even as I thought, I’m still doing this, there was also a Zen, meditative quality to morning prep. Hours flew by: slicing onions, picking cilantro leaves, roasting peppers, blowtorch-searing cauliflower florets, preparing ash de mar (vegetable scraps charred under the salamander and ground with salt and chiles), cubing braised lamb belly and cooking yellowtail sous vide. Past noon, the rest of the chefs and kitchen staff arrived. Focus pivoted to building mise en place for each station. I took up a post just to the side of the pass. When the first orders came in, it was much like at Addison: I struggled to track orders (in part because chef, naturally, called them in Spanish). While service started slowly, the pace quickened by the time the prep chefs left for the night at about 7 p.m. I neglected to inform him that my most immediate previous experience on Fryolator had been at Jack in the Box—nor did I mention I’d been wearing bell-bottoms at the time. “Uno papas frites, chef, all day?” I asked. Uno papas frites turned into dos, and, moments later, two more. I had a station. When pressure was on the appetizers, I worked fry, plating tostada de mar (a tostada of octopus, conch, avocado, a peanut sauce and ash de mar) or working hot line, making elotes en vaso (a Mexican street-food classic: corn, taken off the cob, sautéed with lemon juice and meat stock and served in a cup with mayo, cheese and crushed chicharon garnish). When the pressure was on the main courses, I was assembling pizzas, helping plate dishes or fryingarepas (South American corn-meal cakes). And then it was 10 p.m., closing time. The line was still out the door with another final push of diners to serve. It was at that moment that I realized I was not trying to melt into the wall. I now knew what he meant. The life of a professional cook is defined by hard work and low pay, and it’s day after day. The rock-star status afforded today’s celebrity chefs is, in the end, a Hollywood sheen CGI’ed onto a gritty, hardscrabble craft that—while deeply satisfying—is, in reality, the very opposite of glamorous. And yet, within days of returning home, I was trying to figure out how I could come up with an excuse to do it again. Maybe I couldn’t afford—or my knees couldn’t afford—a lifetime in a professional kitchen. Surely, though, I could do another stage, right?